The area we camped in started filling up overnight, including a pick up with a locomotive horn. Sure got my attention! We headed out just before the 11:00 check out time. Dropped our bathroom cards off at the office and whined about the extra charge for a site that didn't have a better view of the lake than the one next to it (mine). All we got was a shrug. By the way, my site T7 has an open ground that prevented me from running my EMS. It was dry enough that I was willing to take the chance of running without a ground to be able to have air conditioning. We stopped at a Walmart in Mesa to see if they had my El Monterey Chicken, Cheddar & Mozzarella Cheese Empanadas. They didn't. I sure wish there was some consistency in the stocking of them in Walmarts. They are a Walmart only product, and few of them stock them. Too bad; they are good. 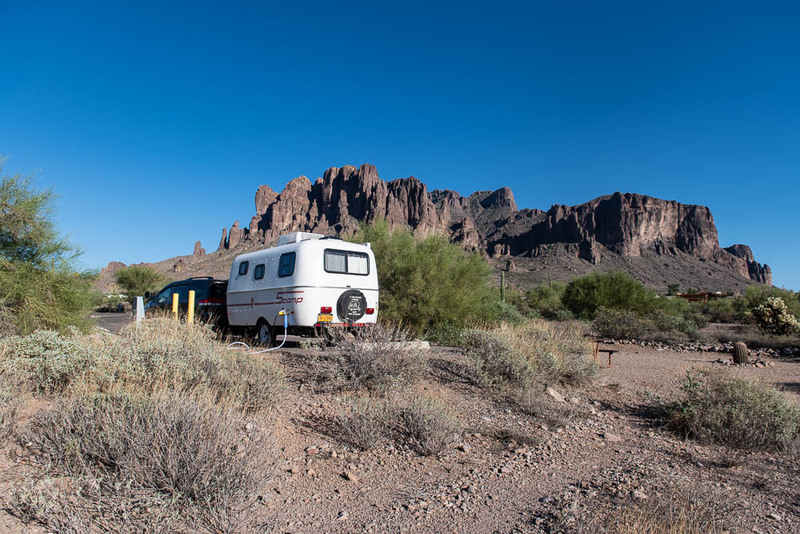 We pulled into Lost Dutchman park, and after a bit of confusion, got to our sites. Don & Anne are in site 24, and I'm next door in site 22. 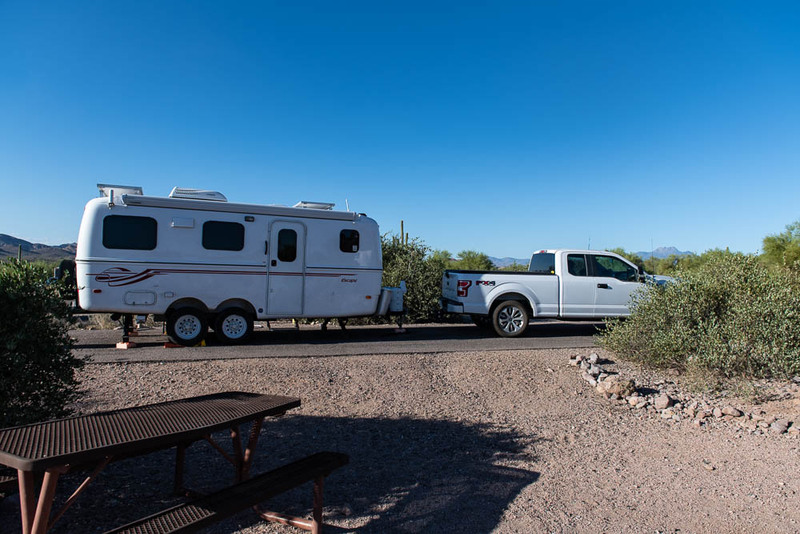 Electric & water sites for $32.50 per night. Paved, and almost level. I could have stayed connected to the trailer, but since Don & Anne's van seems to be losing air conditioning, we decided to take the truck for our trips in the 107°F afternoon heat. It is now down to 93°F at 7:45. The radio tells me the weather will break into the high 80's on Monday, when, of course, we will be further down the road & at 7000'. We decided to head to a restaurant for dinner rather than cook in the heat. I seemed to remember excellent chicken fried steak at the restaurant in the Goldfield Ghost Town, but when we got there it looked different & no chicken fried steak on the menu. I came to the realization that the restaurant I was remembering was at another ghost town, the Calico Ghost Town in California. Same kind of tourist trap. At least the hamburgers were excellent at the Mammoth Steakhouse & Saloon here in the Goldfield ghost town. It was hard to tell the guests from the performers at the saloon - lots of "cowboys" walking around in old west gear. Semi live entertainment. A singer, a guitar & and entire band on the computer. Still, for country music, his voice wasn't too bad.